No pick me! Mandy has a powerful smile - but I have a more powerful scowl! Frightening I tell you - FRIGHTENING! All because I have never ran a marathon - this is all the reason for me to win this log! I'm SO bad about logging my workouts--maybe this would do the trick for me! I've been wanting to try one of those log books out. I've logged on and off in blank notebooks, but it doesn't seem to have the same effect as an official training log. This journal looks fantastic. Throw my name in the pot too Mary! Thanks. Logs are a great way to keep track of things you did leading up to a good or bad workout. Andrew will probably scare the logbook, so let's keep it in the States. Would love to win...I'm obsessed with logs and tracking stuff! OK, I keep 2 (t w o) logs on the computer. I am sure I would love to have one more, this one paper. Can one have enough training logs? Thats really awesome! I log my workouts in 2 places.. On a little calendar I carry EVERYWHERE -that I just printed from the internet- and on the computer at running ahead.com... I have 2 because usually I forget about the computer log, so I have my hand held one to refer back to anywhere and anytime.. This book would keep me pretty organized! Hope that dang sinus infection goes away! Feel better! and hooray for no foot pain! Thank you for offering. I just finished my log and was too cheap to buy another one, so have been keeping track of my workouts in a plain notebook. Would love to have another log. What a great giveaway. This could really help with my workouts. Thanks for the chance to win. Oh this looks awesome, I'd love to win it! What a great giveaway! 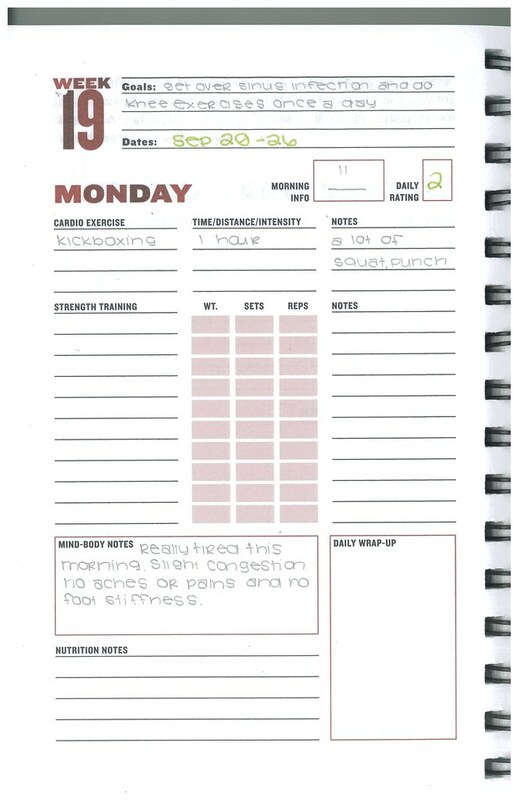 I would love to have my workout journal so neat and organized! Great idea. I'd love to own this. Id love one of these to log my workouts! What a great idea. I love journaling and need to do it more often. Pick me! i'd like a workout journal! i usually just print out sheets with pdf calendars on it and fill in the little blocks with my plans for the week. I love this. I use an online log right now, but I think I would really like using a real book. Sounds amazing!!! I'd love to star logging my workouts! I would love the chance! Thank you! Oh, this would be perfect. I'm just trying to get back into running regularly. I really need to get active! Please count me in. Thank you! That's a great idea. Almost like a food journal...this would be perfect for me. Thanks for the giveaway! How cool is this? Too cool!! I would love to have this to give to my DH for Christmas!!! I am currently pg, and not working out as much, but HE LIVES FOR HIS WORKOUTS!